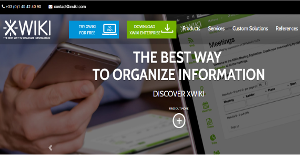 XWiki is the next generation wiki solution for information management and collaboration. It is an extensible platform that allows users to create online collaborative tools. With XWiki, you don’t need to be an experienced developer to fully leverage its features and capabilities as it is very intuitive and straightforward. You can use it right off the bat and even create your own small applications without breaking a sweat. The software also comes with a plethora of extensions and their set is continuously growing. That makes it easy for developers and users to tailor XWiki to suit their specific needs. Whether you are looking for a solution to help you with your document management or create a directory that is accessible to internal and external individuals, XWiki has got you covered. XWiki gives businesses a very versatile and robust enterprise-grade Wiki platform that allows them to better collaborate and exchange information in a manner that saves your company a significant amount of time and money. XWiki comes fully equipped with all the features you would expect from an Enterprise Wiki. The list includes ergonomic WYSIWYG Editing, Page linking, History and Rollback, User and Rights Management, File Attachments, Macros and Advanced Search using the Apache SOLR engine just to name a few. The software helps maximize your collaborative efforts as well as sharing information through internal documents. Building Knowledge Bases for support, sales or HR departments is a breeze. You can also design and implement your own information Intranet or create websites that are purposely created to share information. XWiki boasts more advanced tools that are not offered by other Wiki platforms, providing users with more structure. XWiki comes with a tree navigation feature that makes it easy to organize and place data in items and subitems depending on their parent. Users can also design and create their own applications with XWiki’s user-friendly “App Within Minutes” tool. When using XWiki you are not only structuring the data that you fill in in XWiki, but you also can structure the information from files by attaching them to XWiki pages and use integrated viewers to display them, but also the information from external systems. Because XWiki is built on second generation Open Source wiki technology, you enjoy a higher level of flexibility that you simply can’t get from other Wiki solutions. Full customization allows you to appearance and branding changes such as skins, colors, fonts and logos. What Problems Will XWiki Solve? John is working in a corporation providing services to customers. He also is new at his job and being Friday afternoon, some of his colleagues that know how things should be done have already left. John gets an email from a client that has a problem with one of the services provided and expects a reply as soon as possible. Because his company has implemented XWiki to efficiently store procedure knowledge, he is able to use the Wiki search feature by typing keywords related to that inquiry. He finds the information needed, but the wiki page has a lot of entries. Luckily, everything is sorted using tags and stored in dynamic live tables that helps him reach faster the needed data. John now knows exactly what needs to be done, finds all the information needed and is able to act on the client inquiry. John is able to send the right information to the potential client without having to bother his co workers or lose time trying to get hold of them. This action increases the perceived trustworthiness and professionalism of the overall corporation, and the client will review the company’s services in the best way possible. Key features used: Search feature, dynamic livetables, Tags, Office Imports. Jane is the marketing manager in a medium enterprise and Emily is the sales manager in charge of the European markets. Each of them manages a team of at least 20 employees that expect them to know everything is going on and be knowledge sources, but both of them have a tight schedule that reduces the time they interact. It’s Monday morning. Emily holds the weekly sales meeting so she prepares the tasks and briefs the team on what sales materials they will be using for the following week. Because the company has in place XWiki, Emily is able to see what are the latest updates from the marketing team and finds in time that a new batch of sales materials have been released and are ready to be used. Reducing the organizational silos between the marketing and sales departments, Emily and Jane are able to better manage their teams and stay on top the updates without having to search for information in the endless email threads. Key features used: Search feature, Tree navigation, Rights Management, Activity Stream. James works in a company producing aftermarket auto parts for several renowned brands. They ship worldwide therefore multiple languages are usually expected by their target audience. James is the contact person when it comes to customer support so he needs to know everything there is about installing their products. Before implementing XWiki, many customers had issues in understanding how the parts are supposed to be installed, therefore they were calling James. With these many customers waiting for help, he was overwhelmed and it took days for a reply to be given which reduced their customer service reputation. XWiki has helped them create a documentation platform where this information is now directly available for their customers to search for. It uses tree navigation to sort data based on the car manufacturer. Moreover, they use dynamic livetables to sort the data in a wiki page which featured the same part, but for different car models. The customer reply time has been drastically reduced and James has more time on his hands to keep everything up to date. Key features used: Search feature, Dynamic livetables, Tree navigation, Rights Management. Enterprises have diverse wants and requirements and no software platform can be just right in such a condition. It is useless to try to find a perfect out-of-the-box software product that fulfills all your business wants. The wise thing to do would be to modify the solution for your specific needs, employee skill levels, budget, and other factors. For these reasons, do not hurry and invest in well-publicized popular systems. Though these may be widely used, they may not be the perfect fit for your unique wants. Do your research, check out each short-listed platform in detail, read a few XWiki reviews, speak to the vendor for explanations, and finally select the application that offers what you require. How Much Does XWiki Cost? We realize that when you make a decision to buy Collaboration Software it’s important not only to see how experts evaluate it in their reviews, but also to find out if the real people and companies that buy it are actually satisfied with the product. That’s why we’ve created our behavior-based Customer Satisfaction Algorithm™ that gathers customer reviews, comments and XWiki reviews across a wide range of social media sites. The data is then presented in an easy to digest form showing how many people had positive and negative experience with XWiki. With that information at hand you should be equipped to make an informed buying decision that you won’t regret. What are XWiki pricing details? What integrations are available for XWiki? Pros: XWiki is not simple product, it has extensible development platform so you can easily build online collaborative tools. The good thing is you don’t have to be developer in order to use this platform. I love that this product is open source and it provides lot of options for free. I can easily customize it so it can meet my needs. We are using it to create public web-site where we can put business information and to provide backend so the data can be easily managed on the same platform. I love that I have one tool for organizing and sharing information. Cons: They could improve the UI and its usability. Those who are new have some difficulties because they meet lot of features at once. Sometimes it can be frustrating to create some collaborative tool but on the other hand we have smart and extremely customizable tool. Pros: This software allows us to add new articles easily, and it offers great options for formatting text. I love the “Code” macro and I’m using it to add extracts of the code so it will be shown formatted perfectly. I love the possibility to add CSS styles to the components and texts. Cons: I found that the hierarchy of the pages is bit confusing for me. Also, the WYSIWYG doesn’t work as I would like to, sometimes I cannot copy text within the editor area when I select the tab, so I have to change the Source tab in order to do it.